Meg ha s now been fully commissioned and the planned the official launch into service takes place on Thursday November 3rd. Vic Reeves and his wife, Nancy Sorrell, have kindly agreed to officiate. A brief ceremony will be held at The Cricket Pavilion, Charing Playing Fields, Charing, TN27 0JJ at 10.30am. 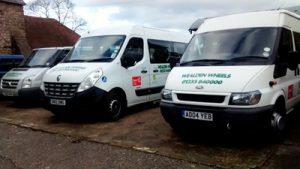 Wealden Wheels is a not-for-profit community transport service supported by funding from local Parish Councils, Kent County Council, Ashford Borough Council and other bodies. Based at Pivington Mill in Pluckley, Wealden Wheels has been a big success since it was established in 2004. Further information is also available on the Wealden Wheels website.